If he can use it… so can I? – Ximena. With an ASOS premier membership it is easy to over shop. Basically it is a $29 fee for two-day shipping for an entire year with some other perks. I was recently doing some holiday gift shopping/Black Friday splurging and happened upon the men’s gifts page. I did manage to find some special gifts but I was lured into buying a set for myself. And what was it that lured me in? This face. I have a small obsession with Bulldogs…. kinda basic I know. This obsession started with frenchies and has quickly moved the the bigger, bulkier English Bulldogs. So the tin and brand name got me but I ultimately kept it for the scent. This set comes with a Original Face Wash and Moisturizer, both in a green tea scent. Tried both products in the set last night, feel like I need to give it a couple of weeks before a proper review but this will do for now. The scent is very… manly? Like that manly man smell. I love it. I would love to know what about it makes it specifically for men? For the most part it seems unisex other than the smell. This would actually make a great gift for any man in your life who likes straightforward skincare with natural ingredients(their tagline which is also quite catchy). They get huge brownie points for never containing artificial ingredients, synthetic fragrances, or ingredients from animal sources. Also for actually being made in the UK. 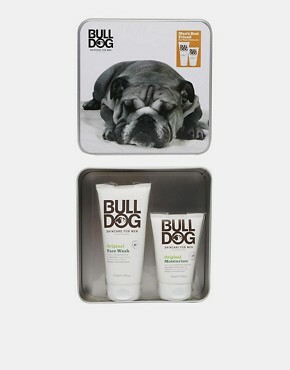 Click the picture for the link on where to buy the set, Click Here for the BullDog site.